Menopause is a period of some dramatic changes in women’s life, which is why changes in lifestyle must be operated, as well. Instead of hormone replacement therapy, women are often advised to make changes in their diet, and exercise more often. Certain compounds and ingredients that can be found in food or natural supplements are particularly helpful for women experiencing symptoms like hot flashes, mood swings, irritability and insomnia. Soy isoflavones are known to help fight such symptoms, and they may be a good explanation why many women living in Asian countries encounter fewer problems related to menopause than women living elsewhere. Aria One-A-Day Tablets From Klosterfrau is a product based on nothing else but these compounds, and promises to help women relieve unpleasant side effects of menopause. What Does Aria One-A-Day Tablets From Klosterfrau Contain? This is the only active ingredient and no other information is provided regarding the content of these pills. While soy isoflavones are essential for any natural treatment of menopause side effects, we doubt that they would be enough to cater to all the needs women going through such important hormonal changes have. As the name of the product indicates, one tablet a day is the recommended dosage. 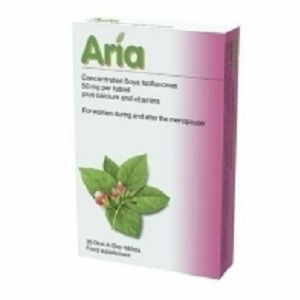 The listing price for Aria One-A-Day Tablets From Klosterfrau is 12.99£ for a bottle with 30 tablets. We did not identify any clear money back guarantee on the manufacturer’s website. However, they have a contact form you can use for any questions you may want to address them. Aria One-A-Day Tablets From Klosterfrau is based on a single ingredient, which is a bit unusual for a market of menopause supplements that counts on various combinations of traditionally used remedies to help women go through this period in their lives without unnecessary suffering. The active ingredient used is soy isoflavones, known to remedy hot flashes, as they are a source of phytoestrogens, effective for maintaining healthy bones density and reducing the appearance of osteoporosis. Jackie Horowitz	reviewed Aria	on February 9th	 and gave it a rating of 2.5.